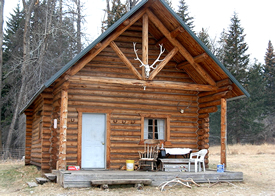 Chimney Rock Outfitter's hunting camp, south of Livingston, Montana consists of two comfortable cabins. The older, constructed in 1942, is the cook and dining cabin. The newer, built in 1997, is reserved for our hunting clients. 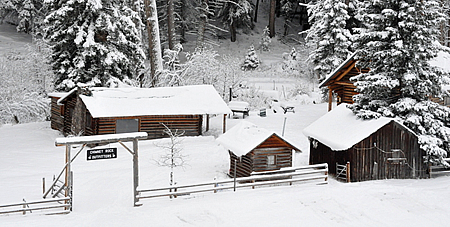 The hunter's cabin is equipped with eight log-framed beds and a wood stove for your comfort. We have full bathroom facilities with indoor plumbing so you can enjoy a nice, hot shower after a good day of hunting. A propane generator provides electricity for our hunting camp. Both cabins are situated alongside clear-flowing West Pine Creek. Some guests have commented that sounds of the creek are so restful, they wish they had one back home. Guests regularly compliment our camp as being very comfortable and cozy. A perpetual burning fire in both cabins is tended by the camp cook, assuring a warm and dry space for you at the conclusion of each day's hunt. Kick back and enjoy. Coffee, homemade cookies and snacks are plentiful! 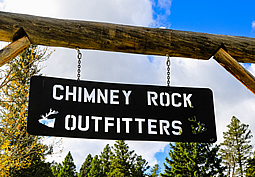 "I've hunted with many outfitters in several western states and I've got to say, Chimney Rock Outfitters treats you the best. Their down-home, comfortable hunt camp is just right: warm, clean, rustic. Nothing fancy here – everything you need and nothing you don't. I'm always tempted to stay a day or two extra after the hunt just to enjoy the place. It's great!"